With more functionality being moved online, the web browser is the new computing hub, and users expect the browsers to perform like a web application. AngularJS enables the browser to dynamically render and display content, making download on the server while providing the UI developer enhanced flexibility to give intuitive web page designs. With increasing demand for single-page applications and the requirement for intuitive UI with compelling content, AngularJS is emerging as the development platform favored by cash-rich enterprises and bootstrapped startups alike. AngularJS has accredited from being an elegant framework that has the fan following to becoming a web technology that is driving business growth. AngularJS is now being mandated top-down by companies whose core business depends on a strong web presence. Therefore, new AngularJS job opportunities are opening up, and AngularJS developer role becomes one of the highest paid jobs today. So, let’s figure out why to choose AngularJS as your career. The web developer job is projected to grow as the eCommerce continues to expand. The individual applying for the web development job with AngularJS often have experience in the AngularJS development. With proper skills, experience, hands on the training and the web developers can specialize in the certain area of the progress and establish their career in the perfect direction. In the today market, there is a broad range of opportunities available for the web developer. Most of the startup and MNC companies hire AngularJS developers for their web development projects. The popularity of AngularJS pretty much gives a bright picture of the demand for skills. The US Bureau of Labor Statistics announced that the unemployment percentage for web developers dropped to 0.7% of in 2014, which is well below the 2.7% rate for all IT jobs. Furthermore, the rate of hiring for the Web Developer job shot up consequently. Matt Leighton, director of recruitment at Mondo, a tech staffing company, has perceived that web development is one of the challenging skill sets to find. He also declares that the demand for this skill has not been reached as there is not the adequate talent to fulfill this requirement. Furthermore, as indicated by Tom Renda, VP of Eliassen Group in New England, web developers are in high demand. 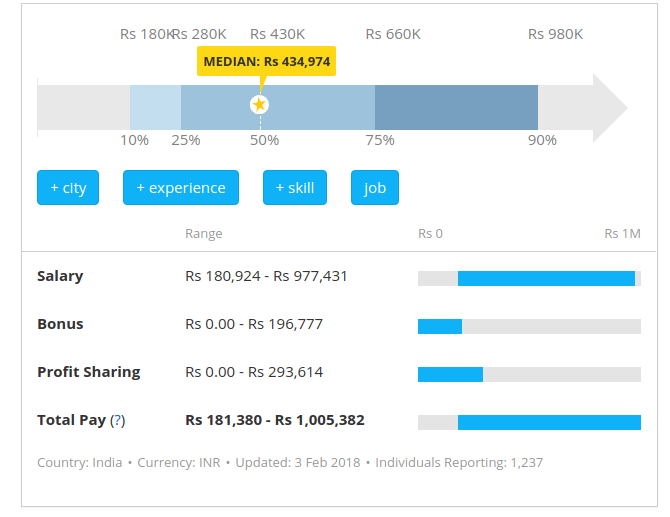 According to PayScale.com survey, the average pay for a Front End Developer / Engineer with AngularJS skills is Rs 425,863 per year in India. Experience strongly affects salary for this AngularJS developer jobs. Although nationally Front End Developers with a skill of Angular programming get an average $68K every year and those in this profession can find the richest pay at Google, Inc., where the average salary is around $137K. Other employers shelling out of big bucks include Deloitte, Deloitte Consulting LLP, and Accenture, where the Front End Developers generally earn around $92K, $82K, or $80K, respectively. The new version Angular2 has more scope in IT servicing field. So, various major IT firms also highly recommend AngularJS for their future projects. 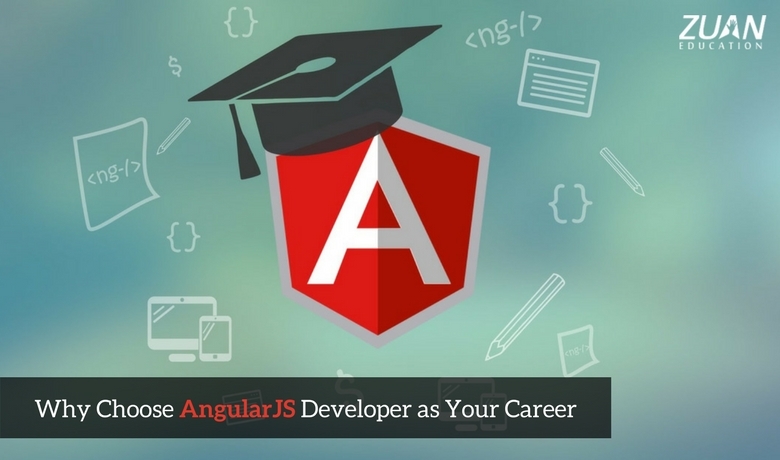 So definitely, AngularJS developers have great opportunity to enhance their career in AngularJS. AngularJS has demonstrated itself to be a reliable investment for web developers. And it remains as a golden asset to professionals who own Angular programming skill. There are many reasons why you should choose a career in AngularJS. Whether you are starting out in your career in IT, or looking for a change, web development offers a lot of opportunities. Learn the latest tools and techniques to become popular with the employers, and to set yourself up for a growing AngularJS career.